Did you know that Beachbody offers a military discount? Yep! That's right! I can help you get 25% discount for FREE if you or your spouse is Active Duty Military, Retired Military, or a disabled Veteran. 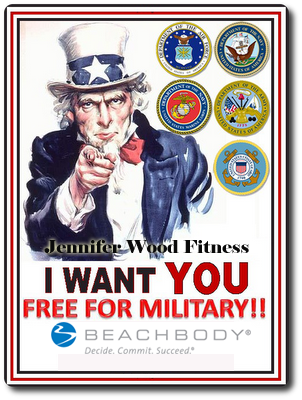 Contact me at jenniferwoodfitness@gmail.com, or sign up here to become a Coach, then contact me for directions on how to submit proof of eligibility via email. Military discount for Army, Navy, Air Force, Marines, and the Coast Guard. No quotas, minimum purchases, inventory required. Make additional income by sharing these amazing products with your friends and family. I can show you how!